Intergenerational equity, understood as fairness between generations, is a universal concept across the world and across cultures. It is a principle that informs constitutions, international treaties, economies, religious beliefs, traditions and customs. Today, there is an increasing awareness of the moral imperative to ensure that future generations of humanity can live full and healthy lives, underpinned by the dignity and rights promised by the Universal Declaration of Human Rights. This requires meeting the needs of present generations without compromising the ability of future generations to meet theirs. The Principle of Climate Justice “Support the right to development” emphasises the interdependence of all people and the earth and the need for a development first approach to climate action particularly in developing countries. Success in eradicating poverty, reducing inequality and turning the tide on climate change is essential to ensuring intergenerational equity and advancing climate justice. In agreeing the 2030 Agenda for Sustainable Development and the Paris Agreement on climate change in 2015, the global community set out a blueprint to ensure that the current generation can realise a more secure and prosperous world. Both of these central global frameworks recognise the importance of protecting our world for future generations and ensuring intergenerational equity. However, while there are now over 200 international agreements and UN General Assembly resolutions which recognise the need to safeguard the wellbeing of future generations, there is no mechanism by which the interests of future generations are represented in current decision making processes. 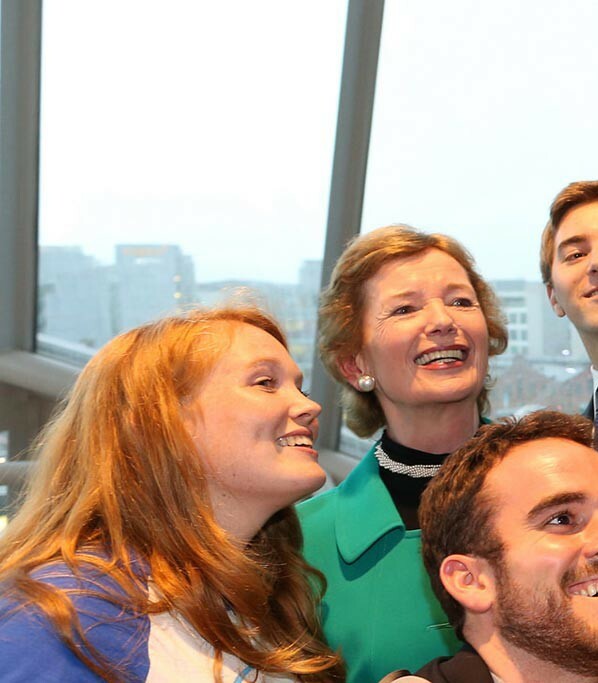 The Mary Robinson Foundation – Climate Justice proposes that Global Guardians for Future Generations be appointed by the Secretary-General of the United Nations to provide a voice for future generations and to help achieve fairness between generations in the context of sustainable development. Global Guardians for Future Generations would represent, advocate for and give voice to, future generations. The Guardians could represent countries at different levels of development and in so doing help to balance the needs of current generations living in poverty and underdevelopment with the economic, social and environmental needs of future generations. The Foundation is working with member states, the UN system and civil society to build momentum and support for Global Guardians for Future Generations and to determine options for their establishment under the UN. In 2017, the Foundation published the position paper, Global Guardians: A voice for future generations, which articulates the value of providing representation for future generations within the UN system. The Foundation has engaged in the area of Intergenerational Equity through a variety of initiatives. Effectiveness: whether they effectively realise obligations to future generations; balance the interests of future generations with those of the present and protect the right to development of the poorest and most vulnerable people; and whether they distribute burdens equitably. Moral legitimacy: whether they promote or violate other moral values (like procedural justice or democracy). Findings indicated a number of steps to be taken in order to ensure that intergenerational equity played a role in the formulation of an equitable and ambitious climate agreement in 2015. The importance of the need to apply the principles that underpin intergenerational equity within the new climate agreement was also highlighted by participants at a high level meeting co-hosted by the Foundation and the Polish Presidency of COP 19/ CMP9 in December 2013. Participants also emphasised the value of an intergenerational approach in informing climate actions. In 2014 the Foundation identified ways to apply the principle of intergenerational equity in practice in international policy making, and recommended the creation of a new institution at the international level to represent future generations and provide oversight of policies related to climate change and sustainable development. In 2015, the Foundation published a position paper on “Meeting the needs of Future Generations: Applying the principle of intergenerational equity to the 2015 processes on climate change and sustainable development”, taking into consideration the role of an intergenerational equity approach in relation to the two major agreements in 2015, the signing of the Sustainable Development Goals as well as the Climate Agreement of the United Nations Framework Convention on Climate Change at COP 21 in Paris. Ensuring a safe world for young people and future generations starts with ensuring all people can realise their right to development.